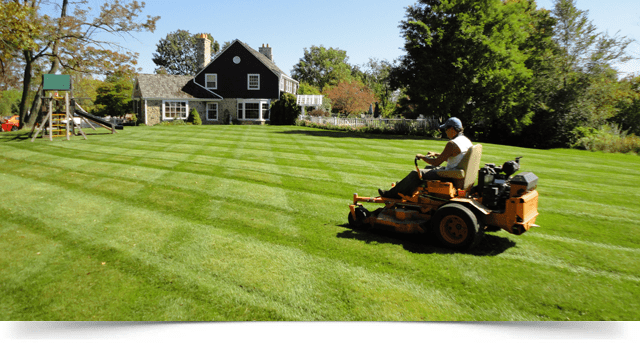 You have many options of lawn mowing services in the Milwaukee Area, but trust the best! Terra-Firma has decades of landscape and mowing experience. Our professional, helpful team will mow your residential or commercial property to keep your grass lush and healthy. Contact our team today to ask about our lawn mowing services and find out why more homeowners and businesses choose Terra-Firma: 414-422-9440. The grass is always greener…where you mow it! Lawn care is critical if you want to maintain the beauty and appeal of your residential or commercial property. Terra-Firma Landscape is among the most trusted landscapers in Southeastern Wisconsin. We’d love the opportunity to make your lawn greener and more beautiful. Lawn mowing and lawn treatments are some of our most popular services. From the traditional city lot to a multi-acre commercial property, we do it all! With several state-of-the-art mowers we are equipped for steep hills, open fields and small spaces. We take pride in our lawn mowing to give you a professional looking landscape. Our team can also help you maintain your lawn through our lawn treatment program. We customize each lawn treatment plan for your specific yard to ensure proper growth. We’re able to help maintain lawns of any size, shape, or slope. If you need mowing services, please give us a call! We’d love to speak to you about your needs. Investing in your lawn improves your home’s value! According to the Lawn Institute, a well-maintained landscape can increase your home’s value by 20%. Just by keeping up with mowing and maintenance, you’re adding curb appeal and value to your home. Think about it. Have you ever driven down a neighborhood street and noticed homes with overgrown lawns? They instantly look rundown. Improve your home with a beautifully maintained lawn. With a well-mowed lawn, you’re more likely to relax outside or host gatherings in your nice outdoor space. You can even let the kids run around barefoot with no worries (except when they come back inside the house). Just by properly maintaining your lawn, you’ll increase your home’s value and improve your life! At Terra-Firma Landscaping, we love hearing from happy customers how much they love and use their lawn. Call us today and speak with our friendly staff on lawn mowing options. Not only does mowing help your lawn look lush and healthy, it has some hidden benefits you may not have thought of before. We even offer a bonus benefit that saves time and stress! If you properly mow your lawn, you’ll less likely to experience weed control issues. Grass that’s mowed too short leaves exposed soil and allows weed seeds to find space to grow. Grass that’s too long can harbor weed seeds and mildew. Regular mowing cuts down the poorly growing grass allowing the healthier, sturdier grass to grow in. Each time you cut your grass, you’re helping the better, stronger grasses grow! By keeping your grass at a consistent level, you’re keeping pests at bay. Let your grass grow long and you’ll likely create an environment for various insects and small rodents to thrive. Consistent mowing makes lawn maintenance easier! You’ll be on top of any thatch buildup, weed control needs and leaf removal. Simply put: save time and stress! Once you book your lawn mowing with us, you won’t need to worry about it again. Our professional team arrives on time, every time and properly mows your lawn to perfection. Call us today to talk to with expert lawn mowing team at 414-422-9440.